Expect an in-depth look at the FPS and "much, much more". Bethesda will be hosting its fifth E3 conference this year. The publisher's announcement comes when others are stepping back a bit from the gargantuan show. EA isn't doing a press conference this year, for instance, and Sony won't be on the floor at all. 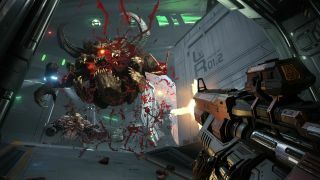 Bethesda's conference will kick off at 5:30 pm PT on June 9, though it's still keeping the contents of the show a mystery, aside from the promise of an in-depth look at Doom Eternal. Undoubtedly, everyone really wants to more about The Elder Scrolls 6, which Bethesda teases a little bit in the event art. That's still expected to be a long way off, however, and Bethesda's got plenty of other games cooking away, including Starfield, Rage 2 and Wolfenstein: Youngblood. We'll probably see a Fallout 76 announcement, too, which has updates planned for summer and autumn. If making a trip to LA sounds unreasonable, you can watch the show on Twitch, YouTube, Twitter, Mixer and Facebook Live.